In order to know how to play tennis, a good understanding of the tennis rules and court dimensions of the game must be understood. Tennis is played between two players, this is called singles or two teams of two players, four in all, this is called doubles. Play starts when the player whose turn it is to serve attempts to hit a ball into play. Play will then continue should the receiver manage to return the ball back to his opponent. This phase is called a rally. The point is contested between the players. This rally continues until either the ball lands out of play, or hit’s the net without managing to pass over to the opponents side or bounces twice before a player can return it to his opponent. The primary rule is that a player can only hit the ball once before returning it to his opponent. How to play tennis is a new skill that has to be developed with the proper practice. 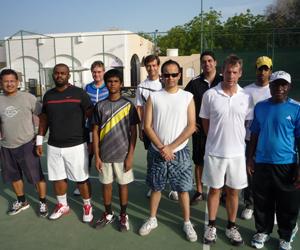 A solid understanding of how to play tennis is necessary to acquire the skill set needed for tennis. When getting ready to play tennis, the beginner should consider their clothing. Many players prefer to wear comfortable shorts or a short sports skirt for a female player if the climate is favorable. A short sleeved sports shirt is recommended and sports or tennis shoes are very important to maintain grip when on court. The apparel should be comfortable and allow for maximum movement.